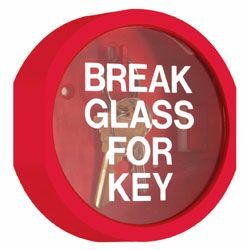 The Safety Centre now have a selection of Break Glass Key Boxes available to buy online. A break glass key box is an ideal solution to where to store important keys and documents which need to be accessed in emergency situations, whilst also detering malicious access to them. The Break Glass Key Box range from The Safety Centre feature units manufactured by STI Europe and Hoyles. There are also units available with an integral sounder which operates when the glass is broken which acts as a further deterant to malicious access to the keys or documents and provides an audible alarm to attract attention once the glass has been broken.